Brand-new to the Die’sire range are the new Snow globe and Bauble dies, plus co-ordinating stamps. 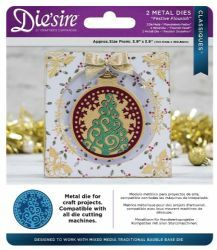 Including Mixed Media base dies Snow Globe Base, Vintage Bauble Base and Traditional Baubles Base, the accompanying stamps and decorative dies can be used to add your own personal flourish. Perfect for creating beautiful shaped cards and decor items for adorning your home this festive season, they’re a versatile new addition to your craft stash that can be used for a range of different projects.